When you go into a store, you expect to safely complete your errands. It is the responsibility of the store owner to strive to create a safe, reliable environment in which customers and employees can go about their days without worrying. But there are instances in which someone’s carelessness can lead to serious injuries. Below, we’ll outline some common slip and fall accidents and what you can do if you find yourself the victim of one. As always, the Aranda Law Firm is here to help. The most commonly known instances of slip and fall accidents take place in the supermarket. 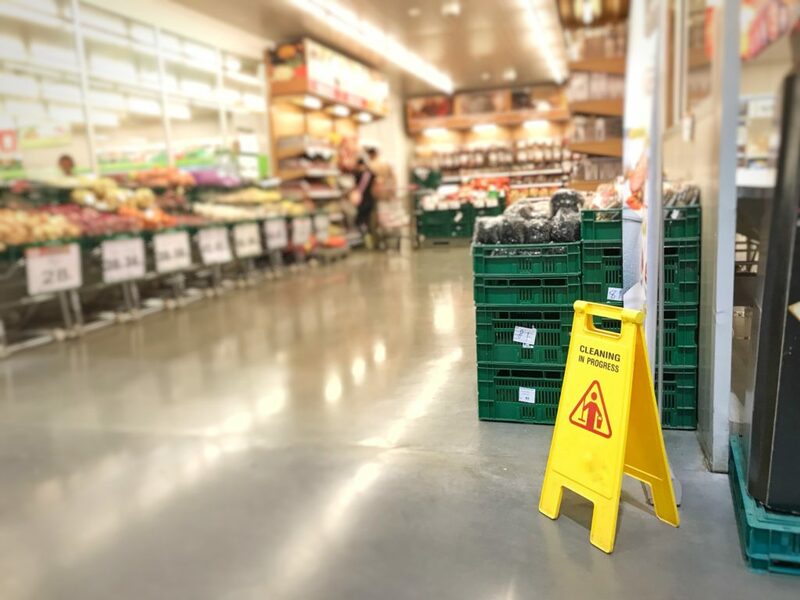 If an employee mops the floor but she forgets to put up the “wet floor” sign, it is highly likely that someone may slip and fall, resulting in an injury. Another example can be uneven steps within a building. If someone’s walking downstairs but one step is slanted or shorter than the previous ones, the person will undoubtedly fall and injure him or herself. As we all know, injuries resulting from falling down stairs (especially concrete stairs) can often result in broken bones and further, serious injuries. Perhaps the stairs outside of a supermarket have become weathered after years of use and it was just an unlucky day when one step was miscalculated, resulting in a serious injury. These issues are all the responsibility of the store owner or the company itself. It is their responsibility to create a safe environment for their clients. When they fail to do so, the responsibility falls on their hands. Slip and fall accidents are often maligned, not taken as seriously as they should be. But if you or a loved one has suffered through an accident, it’s necessary to speak with a personal injury lawyer as soon as possible. When it comes to personal injuries, such as slip and fall accidents, you shouldn’t be responsible for paying for the medical bills. While you’re recovering, you’ll also lose wages from work. All of this because of a store owner’s irresponsibility to maintain a safe and reliable environment. When you work with a personal injury lawyer, you’ll be able to recover in peace. Personal injury lawyers understand the complexities of slip and fall cases. Attorney Marco Aranda will fight for you and recover the damages you deserve. Don’t let a slip and fall accident stop you in your tracks; contact the Aranda Law Firm, today! My case was a long one…took over a year. But Mr. Aranda made everything work out in my favor. He’s very professional and knows his business very well. I have recommended him to people I know who needed legal help and I recommend him to you too. I was very impressed with Mr. Aranda’s honesty. And he was very frank and forward. He set the plan in motion, and my case was actually finished fast. He is a great attorney! Marco Aranda is a rare gem… he’s straight-up and very honest, which are rare attributions with anything these days. Everything I asked him to do for my case was done and it went as well as I could have hoped. I’m very pleased with him and his services. Mr. Aranda brought about the best results. From the get-go, he was sincere and cared about my case and the outcome. He helped me finalize my divorce and I couldn’t have asked for better results, so 2 thumbs up for sure. I can assure you, you will not be disappointed with the Aranda Law Firm. Mr. Aranda is just wonderful and will take time and meet with you personally regarding your case. Him and his staff are professional and very good at what they do. I recommend you give him a call today!